So multiplying the right side of the equation by 4 will result in an approximation of PI. Although PI can not be represented as a fraction, it can be found by infinitely adding and subtracting fractions (this is called an infinite summation). Even index terms are added and odd index terms are subtracted. Each term is just the reciprocal of 2n-1 (e.g. 1/(2n-1)) where n is any natural number. Initially, the summation does not show much promise. The sum of the first 12 terms is approximately 2.8952 – not very close to PI. However the sum of the first 200 terms is approximately 3.12159 – much closer! I have created a quick program that computes the approximate of PI based on the number of summations you input. Try 1000, 100000, 1000000 (a million) and 1000000000 (that’s a billion – it takes a few seconds) to see how the approximation converges towards PI. 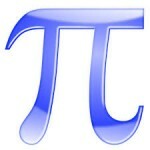 Have fun with PI and HAPPY PI DAY!